Chicory ( Cichorium intybus L). 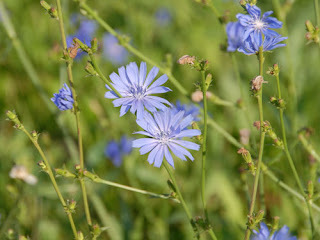 When flowering, chicory has a tough, groove, and more or less a hairy stem, from 10 to 40 inches tall. The leaves are stalked, lanceolate and unlobed. The flowers are usually bright blue, sometimes white or pink.